Generally it makes sense to initialize the profiler as soon as possible, to measure as much execution time as you can. You should initialize the profiler in your front-controller or the bootstrap file right after requiring the Composer autoloader. To visualize the profiling results, you have to initialize and render the Prophiler Toolbar. This component takes care for rendering all results of the profiler benchmarks and other data collectors. Put that at the end of the front-controller. You can also add other data collectors to the Toolbar, to show e.g. request data like in this example. You can also easily create you own data collectors, by implementing the DataCollectorInterface and adding an instance to the Toolbar. 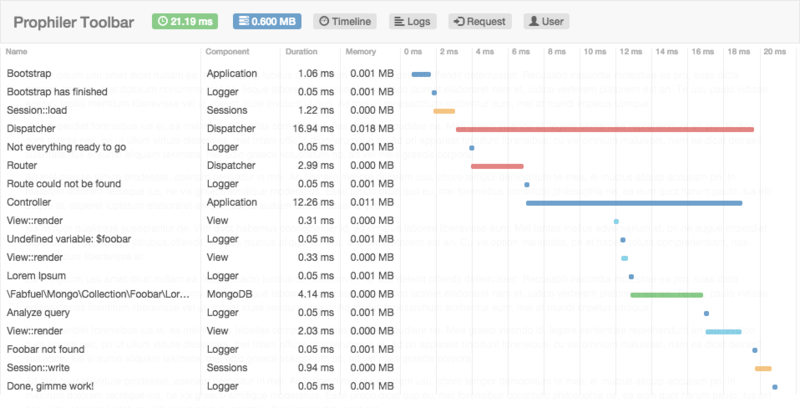 Add the profiler instance to the DI container, that other plugins and adapters can use it across the application. This should be done in or after your general DI setup. The plugin manager registers all included Phalcon plugins automatically and attaches them to the events manager. To make the plugins work properly, make sure that the default events manager is attached to your Dispatcher, View and Connection services. In some scenarios (e.g. custom adapters) it might be hard to pass the received benchmark to the stop() method. Alternatively you can simply omit the $benchmark parameter. If that is the case, the profiler simply stops the last started benchmark, but it is not possible to run overlapping benchmarks. That's it. You immediately see all database and cache queries, grouped by command/query, including the total number of executions, the total duration of all executions as well as the minimum, maximum and average execution time. please feel free to contact me, and I will try to help you. © Fabian Fülling. All rights reserved.